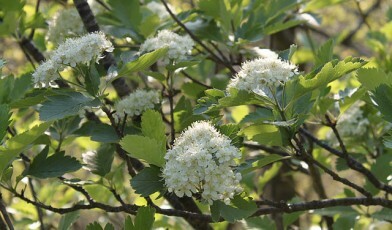 Known in its native tongue as Cerdin Darren Fach, the Ley’s Whitebeam (Sorbus leyana) is widely considered to be one of Wales’ rarest trees. One of thirty-four species of Sorbus in Great Britain, it mostly grows as a shrub with its trunk pressed close against rock faces though in more exposed areas, it’s also known to form an erect tree. Discovered and named in the 19th Century after the botanist and vicar, Reverend Augustin Ley, Sorbus leyana is thought to have evolved as a natural hybrid between Mountain Ash (S. aucuparia) and either Rock Whitebeam (S. rupicola) or Grey Whitebeam (S. porrigentiformis). Since its discovery, quarrying around its native habitat has destroyed many of its former sites and now roughly 11 individual trees are left clinging to steep limestone cliffs at just two sites in the Brecon Beacons. With so few individual plants left in the wild, the greatest threats are now largely from grazing, trampling and the species’ own low reproduction. Woodland regeneration is also threatening this species, as shading prevents flowering and fruiting. It is also extremely restricted in its range. Whilst both of its remaining locations receive limited protection as Sites of Special Scientific Interest and a small number of plants raised from seed have been incorporated into the wild population, S. leyana continues to face severe threats and was therefore assessed as Critically Endangered (CR). In 2002, one particular S. leyana growing beside the Ranger’s office of Forest Enterprise Wales was chosen to commemorate the Queen’s Golden Jubilee. It was one of fifty different trees selected to mark each year of the Queen’s fifty year reign; each was picked due to its uniqueness whether in age, size, rarity or cultural value. Valuable publicity for this little known and seriously threatened species. Rich, T., Houston, L., Robertson, A. and Proctor, M. 2010. Whitebeams, Rowans and Service Trees of Britain and Ireland. Botanical Society of the British Isles, London. Rich, T.C.G., Motley, G.S. & Kay, Q.O.N. 2005. Population sizes of three rare Welsh endemic Sorbus species (Rosaceae). Watsonia 25: 381-388.